Keith Hudgins, Craig Revere, Capt. Fin Gaddy, Bailey Hudgins, Bill Hudgins, Steve Callis, Nick Rhem, Mate Colin Oxnard, and (kneeling) Josh Theil. Not pictured, Brad Hudgins. WOW! Bite of a lifetime! 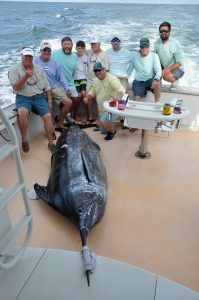 The team aboard the Paul Mann custom built 56-foot sportfish QUALIFIER hooked up a real monster not long after “lines in” on Friday, August 25, 2017, at the Virginia Beach Billfish Tournament. According to owner Captain Fin Gaddy, “I was watching the spread when this fish came completely out of the water from the side and completely crushed my short shotgun. It has to be the most incredible bite I have ever seen!” But with angler Craig Revere in the chair and Gaddy on the bridge, and some of the best in the business on deck, the fight went very quickly, and mate Colin Oxnard soon managed to get two 12′ flying gaffs in before the fish went crazy. Even so, at 9:41 A.M. the team boated an amazing 801-lb. blue marlin to take the win. The team aboard QUALIFIER received a check for $237,250 for their 941 points which included the huge marlin caught Day Two, plus two sails caught the first day of fishing and reeled in by Nick Rhem and Brad Hudgins. QUALIFIER won the billfish jackpot, the high roller jackpot, the marlin jackpot and the Friday billfish daily. 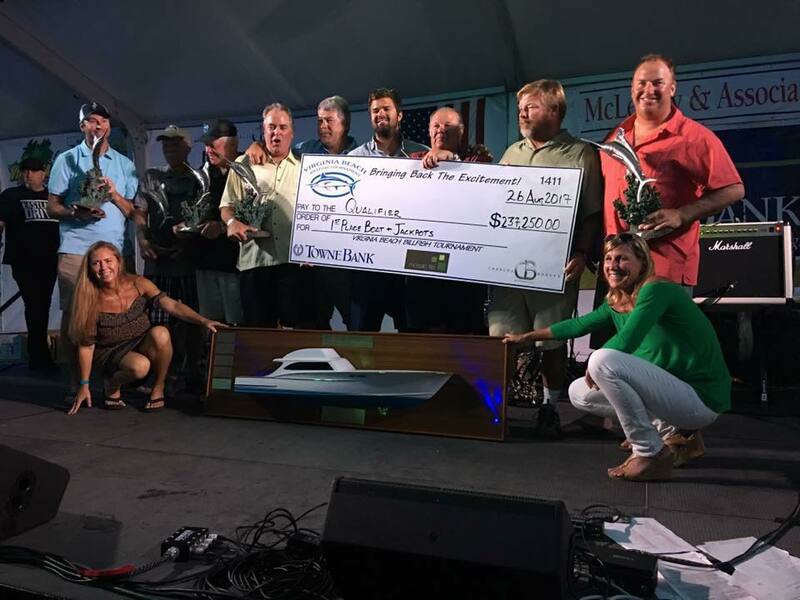 QUALIFIER also received the prestigious F. Wayne McLeskey top boat award in honor of the late Wayne McLeskey, Jr., whose love and support of the tournament from its creation has allowed the event to be held from his property south of the Rudee Inlet. This year, 75 of the East Coast’s top boats fished this increasingly popular three-day tournament. Overall, 263 billfish were caught including 12 blue marlin, 218 white marlin, 21 sailfish, and 12 spearfish, plus some big yellowfin tuna, dolphin and wahoo. Excellent fishing! Paul Mann Custom Boats sends a huge shout out and congratulation to the team aboard QUALIFIER and to ALL the participants in this great Virginia Beach competition, especially the Paul Mann fleet also including A SALT WEAPON, ANN WARRICK, POOR GIRL, and SNIPER! 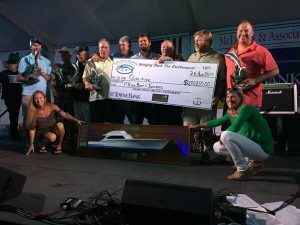 This is the second year in a row that a Paul Mann Custom Boat has won the Virginia Beach Billfish Tournament (A SALT WEAPON was the winner in 2016). The Paul Mann fleet just continues huge success this year and is very proud of our Paul Mann family of owners for consistent winning once again during the 2017 tournament season. That kind of year after year consistency takes some very special teams aboard some very special boats!